Veranda, terrace, bar, tv room, reading room, gazebo. Hall with satellite tv, reading room, bar, veranda, terrace. Safe, mini fridge, cots, baby cribs, toiletries. Elegant and with a refined taste, Hotel President is a three-star Superior family managed near the Aquarium of Cattolica. 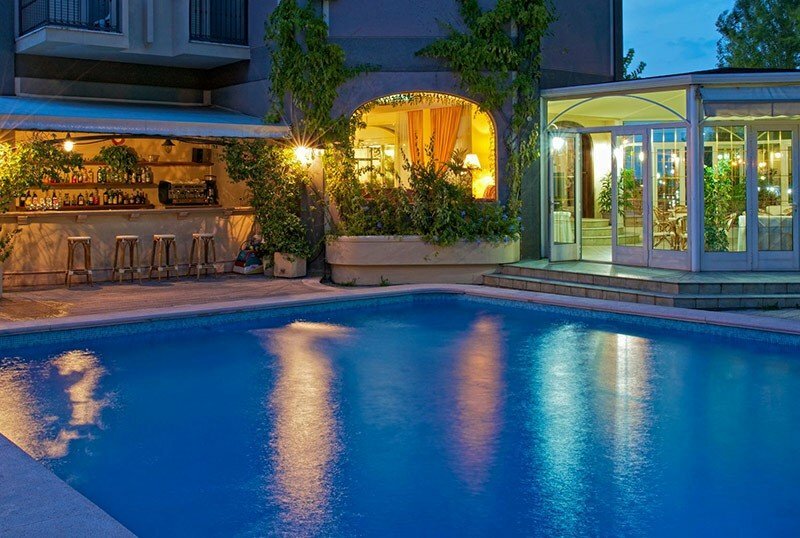 Ideal for family vacations, it has two swimming pools, one for children, WI-FI and parking. It welcomes small pets, which have free access to the beah affiliated with the hotel. The hotel is located in Cattolica near the Le Navi Park and the Aquarium, a 5-minute walk from the beach. All rooms have been recently renovated and have a private balcony (sea or pool view), air conditioning, private bathroom with shower (bathtub in some rooms) and hairdryer, TV sat 22 ", WI-FI, fridge, telephone and safe. 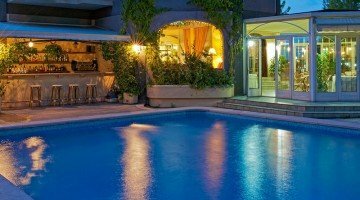 Garden, two swimming pools - one with sunbathing area and the other for children and with hydromassage, gazebo, solarium area, open-air porch, terrace, bicycles available, lounge with satellite TV, reading room, bar, elevator, free shuttle service to the center of Cattolica. Organize theme nights. PARKING: indoor, covered and guarded for all customers. CONVENTIONS: beach, amusement parks, shuttle service, organized excursions. PETS: accepts small animals, which can also access the beah affiliated with the hotel. LUNCH AND DINNER: the cuisine is traditional Romagna with 3 menus to choose meat and fish followed by a buffet of vegetables and side dishes. Pasta and desserts are homemade. Drinks at meals are included (water, local wine, soft drinks). Pasta and desserts are homemade. VARIATIONS: vegetarian dishes are available on request. In the hotel: children's pool, large playground, "Children's House" with games of all kinds, strollers, baby club and mini club, evening entertainment with baby dance and face painting, baby-sitting service, pediatrician. In the room: cots, cribs, WC reducer. At the restaurant: baby food, baby menu, baby seats, flexible hours, bottle warmer and sterilizer, cotton candy, afternoon snack, high chairs. On the beach: playground, baby and mini club. Hotel President has two swimming pools, one heated with a sunbathing area, sunbeds and beach umbrella; the other, smaller and ideal for children, with hydromassage. This area has a fully equipped bar, a open-air porch and a playground area for children, who also find the "Children's House". The hotel has an agreement with the Altamarea Beach Village bathroom which, in addition to sunbeds and beach umbrella, has swimming pools, a wellness center, a playground, playgrounds, a games room, an internet point, and entertainment. In addition, Altamarea is also a dog beach: it welcomes small and medium-sized dogs in a dedicated area provided they have a vaccination booklet.